Sixmile Design, based in Mallow, Cork, specialises in designing and building WordPress websites. 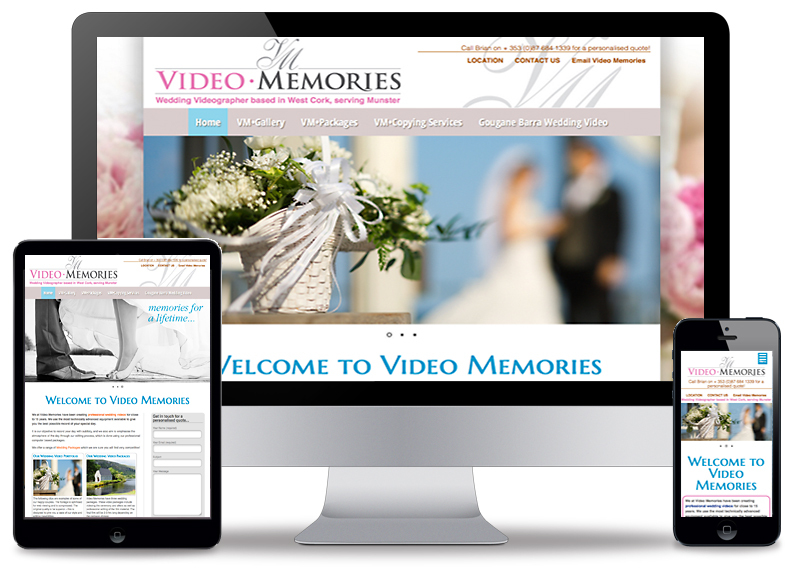 In fact I have just finished a redesign of a WordPress website for a wedding videographer based in Macroom, Co Cork. WordPress is a versatile and powerful Content Managed System (CMS). See Video Memories in Macroom. A website built within a content managed system allows for quick and easy updates through a password protected admin area. Content updates can include new pages, edits to text and uploading of images to the site. I work with two different types of content manged systems - ExpressionEngine and WordPress. ExpressionEngine is a paid for content managed solution and tends to be a better fit for website developers who want absolute control over the website design and build. You are pretty much starting with a blank canvas which means your website can be structured anyway that you want. There is, however, a steeper learning curve with this sytem as oppose to, say WordPress, from a developer's point of view. ExpressionEngine's strength lies in it's ability to handle multiple content channels (or sections), relationships, and custom fields. ExpressionEngine is ideal for complex website design. The downside to ExpressionEngine is the cost associated with the ExpressionEngine licence and cost for technical support. WordPress is probably the most popular content managed system out there. As of today it is thought to be powering 74,652,825 websites (18.9% of all websites). WordPress has come a long way from it's humble beginnings as a blogging engine. Today WordPress is a fully operational content managed system. The password entry admin is relatively simple to use, which makes it a great option for designers seeking to provide their clients with a site that they can manage by themselves. In other words, content updates on the site is easy. The main positive WordPress has to offer is the plugin library. A plugin is a piece of code that adds functionality to the website. There are over 35,000 plugins for WordPress. This includes the very powerful WooCommerce plugin which adds ecommerce functionality to the WordPress powered website. On top of this there are hundreds of plugins that have been created for WooCommerce adding a boat load of functionality to the shop on the website. Also worth noting are the thousands of ready made WordPress templates out there. A ready made template can be very limiting and doesn't compare to creating a bespoke design that will fit the clients unique needs. Coming from a graphic design background I feel it is much better to design and custom build the website creating a solution that reflects the clients business and branding. More information on WordPress Website Design can be found here. These days website security is a massive issue. Unfortunately CMS systems are often targeted by hackers. ExpressionEngine comes out top here as according to the official EllisLab page, there hasn't been a major security breach in ExpressionEngine in Ten Years. While the massive popularity of WordPress and the fact it's built on an open source framework is also it's Achilles heel when it comes to security. Compromise of security could also result from installing vulnerable WordPress plugins and free ready made templates. Again, the great thing about the WordPress ecosystem is the thousands of plugins that are available. However not all plugins are as they seem and can provide an open door to hackers. Without doubt WordPress is by far the most popular content manged system out there. However the choice of which system to implement is determined by the needs of each job. Every client is different and have different needs for their site. So choice is made on a case by case basis. For more straight forward brochure websites, ecommerce websites or portfolio website I would always choose WordPress. For larger sites requiring complex content structure with more detailed custom fields ExpressionEngine would be a better bet. No matter what system is used or how the website is built the website design should be visually striking (as well as functional) utilising the principles of good (responsive) design. Yet at the same time not falling apart when viewed on the mobile phone. It's this principle that will help elevate you above the the competition and will prompt the customer to make up their mind who they do business with. A good looking website will attract attention no matter what content managed system it is built in. See this article 'Website Design & Development' for more information. What is PageRank? And What’s It Got To Do With My Website Anyway?